If you have spent years in the sun, especially without adequate sun protection, then you know what it can do to your skin. Wrinkles, skin discoloration, sun spots, skin laxity may be reduced or eliminated with DOT Therapy. Also, if you have scars from acne or other skin injuries, then you may also be a candidate for this procedure. Unlike older laser technology, DOT Therapy leaves islands of healthy tissue surrounding the microscopic DOTs. This enables your skin to heal more rapidly. Afterward, your skin will be red, similar to sunburn. You may also experience some peeling after about three to four days. 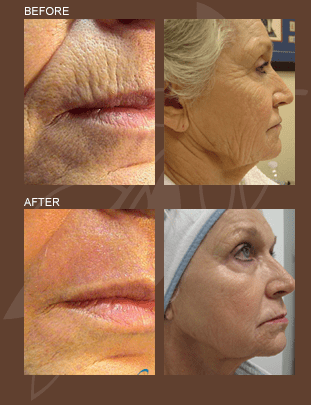 In most cases, your skin will return to its normal appearance in about five to seven days. 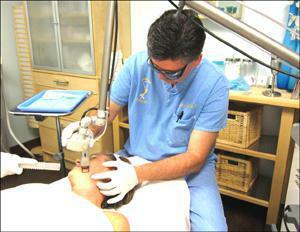 A topical anesthetic is applied to the treated areas for one hour prior to procedure. After the laser procedure is completed, a cold compress will be applied. During your recovery period you will use a prescribed rejuvenation kit to hydrate, heal and protect the new skin. This kit is sent home with you along with full instructions for complete care of the skin after treatment. How much Does DOT Therapy Cost? Depending on the amount of area, treatment costs vary. DOT Therapy can be performed on several areas of the body. Individual results may vary. Click here to visit our photo gallery for actual patients treated with DOT Therapy. All patients are different, results depicted in the photographs are not necessarily representative of all results, and individual results may vary.